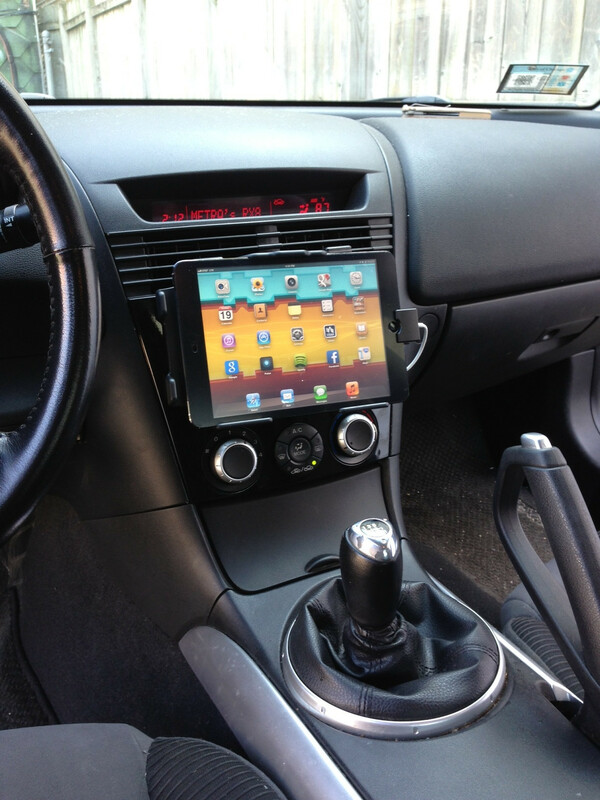 As you may have gathered from the title, I'm thinking about installing an iPad Mini in my dash. But first a little back story: My stereo got ripped off a few weeks ago so I've been riding around with a gaping, wire-filled hole in my dash while my insurance company sorts things out. My old set-up was pretty nice; a double din touch screen dvd mounted in a Metra dash kit. They tore that out and cracked apart most of the dash kit in the process. They also ripped the passenger's side back seat off the frame searching for the amp. Thankfully, I have the amp mounted under the passenger's seat, so it was left unharmed. With the amp spared, all I need to do is send a signal through the remote wire to turn it on. From there I could run whatever I need to through either the RCA cables, OR a 3.5mm jack that also runs directly to the amp. I'm thinking I could cut out the middle man of a stereo and wire everything up to run directly from the source (iPad mini) to the amp. I think it'd be relatively easy to cleanly bridge into the cigarette lighter wiring to set up a power source (or just redirect it there since I quit smoking anyways). The tricky part is going to be adapting or creating a dash kit to mount iPad. If it works out, I'll have navigation and a stereo all in an easily removable set up. Any direction to people that have done this before would be greatly appreciated. Also, anything to consider before I dig in would be good as well. I know there's more than just stereo wiring in there (for example, my trunk button that no longer works). I don't think it's too relevant, but just in case: It's 2004 GT. For ipad install you should really check out Sound Man Car Audio on YouTube. Check out his site and forum as well. Take some time and watch some of the videos from these guys. They have some good stuff on ipad installs and have some cool ways of doing it. Basically I bought another Metra dash kit and fastened a plate of steel to the opening, backed it with some insulation to dampen the sound, drilled holes for the mount (From ProClip, link below), and then just ran the lightening cable behind the mount and through the ashtray to the 12v adapter. This worked for me since all my speaker wiring was still hooked up through an amp, so the sound feeds via bluetooth to a bluetooth receiver (Powered by the 12v plug in the center console) connected to the amp. So no stereo sound, but other than that the quality is great. The other consideration I had was glare, so the iPad has a Moshi anti-glare screen protector, which makes it still barely readable in direct sunlight. 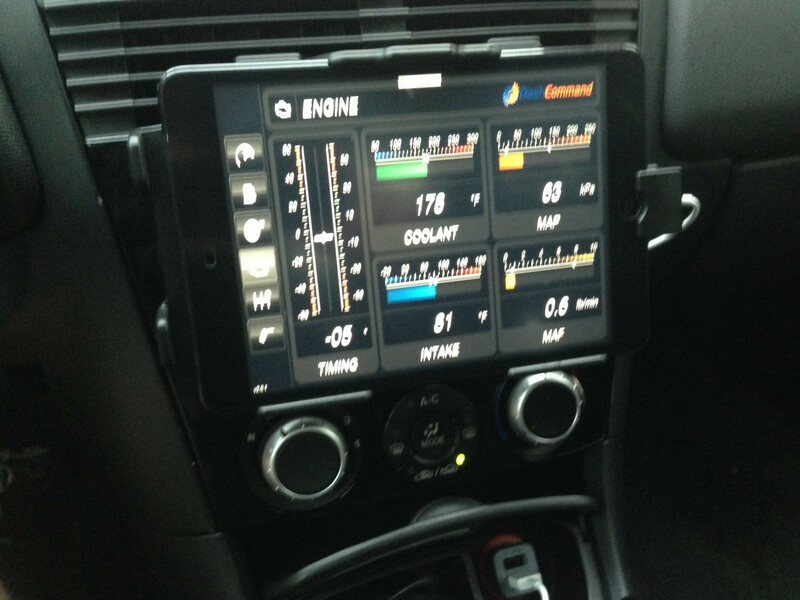 Also, more recently, I bought a wifi OBD II reader which can stream live data through the Dash Command app (See blurry picture). Sort of a novelty, but still fun to play with. Plus it can read and clear codes. Certainly not my finest work, but basically my insurance bought me an iPad mini and I no longer have a stereo in my car to be stolen (I keep the ipad with me 90% of the time or lock it in the glovebox when out and about). Last edited by sapper1stad; 08-01-2014 at 01:43 PM.